If you like a dining experience with a unique view, a visit to the Maldives might be in order. The tropical nation is now home to the world’s largest all-glass undersea restaurant. Guests can break open their Champagne as reef sharks, turtles, manta rays and schools of fish swim past their table. 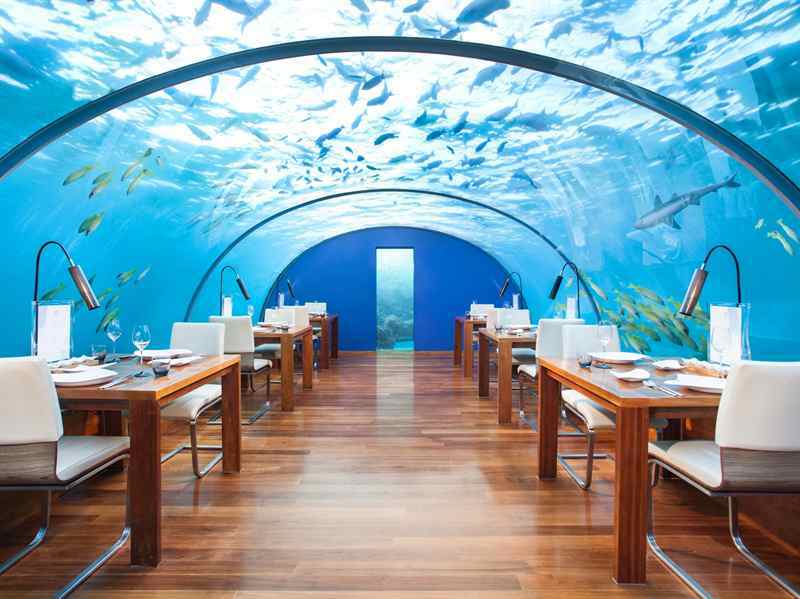 Located 5m below sea level at the Conrad Maldives, the dome-shaped Ithaa Undersea Restaurant boasts a curved glass roof, glass sides and a glass floor, offering diners panoramic views of the sea life beyond. Guests make their way to the hotel’s private jetty, where they descend a spiral staircase to a coral reef below. From here, they pass through a glass tunnel into the restaurant beyond. Featuring only 14 tables, the establishment was constructed in New Zealand before being shipped over to the island of Hurawalhi for installation at the end of 2016. Unsurprisingly, meals at this exotic venue don’t come cheap; a six-course 'sprinkled with romance' dinner will set you back around £382 per person.